Indulgent milkshakes which overflow from mason jars, that are topped high with sugary sweets like cookies, cotton candy, chocolate syrup & cake. Most contain over 1,500 calories & 150+ grams of sugar. Examples HERE. Yowser. Typical Freak Shakes are horrible for you, but oh-boy…they seem so craveable & fun! I decided us #SuperSwappers need to get in on this Freak Shake trend…so I created Freak Shakes…SUPERFOOD SWAP STYLE. 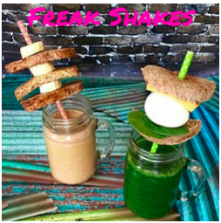 My Freak Shakes are loaded with SUPERFOODS & are just 400 calories or less. They make a perfect breakfast, anytime! My Freak Shakes bring all the #SuperSwappers to the yard. Damn right, they’re better than yours.